In the market of cameras, there are lots of options and lots of things to think about and consider when looking into buying. The type of camera and the focus it has all depend on what you want to shoot. In this article, we are focusing on the Canon PowerShot SX420 and its competitors within the point-and-shoot field of camera models. What Is The Canon PowerShot SX420? The Canon PowerShot SX420 is a point and shoot camera that takes the lead over smartphone cameras with an impressive optical zoom. Today, point and shoot cameras have taken a hit from the progressing high tech smartphones and the cameras they have built in. It is hard to find a point and shoot model that offers more than you already have in your pocket at your fingertips. The Canon Powershot SX420 has added technology and features to make sure its footing is secure and that users have the upper hand over a smartphone. 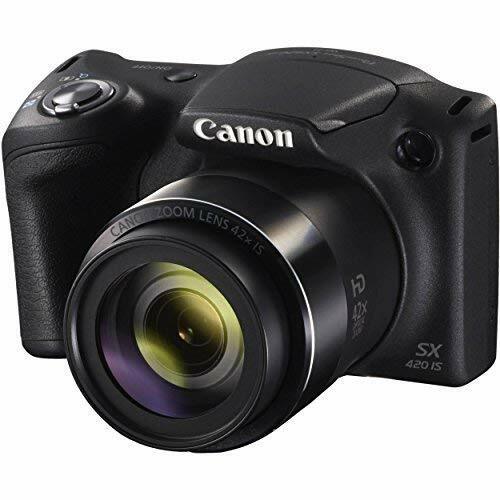 The Canon PowerShot SX420 has a 42x optical zoom, which is not only much more than you will find in other point and shoot cameras in this price range, it is also a marginal difference from a smartphone's zoom. The features do not stop there though. This model also has 20 megapixels to ensure that the zoom is not wasted and you can still achieve great image quality no matter where you rest the zoom. The ISO range is fair and sits in the mid-range, meaning that low-light and well-lit environments are covered. The Canon PowerShot SX420 can shoot 720p video and is Wi-Fi enabled, so transferring photos or videos is simple even on the go. This camera also offers creative shooting modes that are fun to play with and easy to explore. Since prices are always changing (especially in the camera market), we have included an average of the price for the Canon PowerShot SX420. This is based on various price brackets and is a compilation of prices to cover the high and low end. This is a standard price for this type of model with the specs and features it offers, however, if you are looking for something in a lower price bracket, check out used or refurbished options. 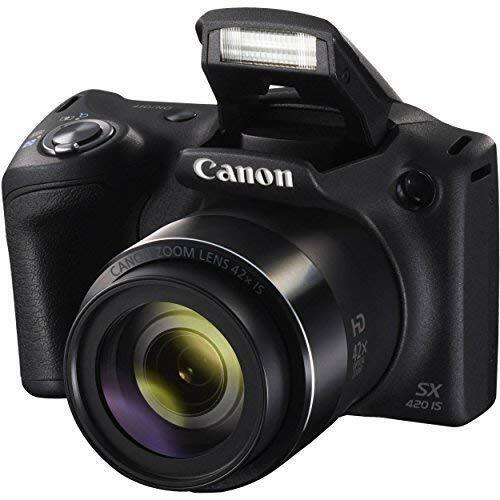 The Canon PowerShot SX420 is meant to be an entry-level or mid-range camera. This means it needs to focus on simplicity and ease of use to fulfill its genre - and it does. Each setting or scene mode is simple and easy to understand, and no aspect of this camera is complicated enough to require lugging the instruction manual around. It is intuitive and handles well. As an entry-level camera, expecting the Canon PowerShot SX420 to keep up with models like to T7i or more professional DSLRs would be unrealistic. However, for the specs this camera offers, it - for the most part - delivers. Image quality is maintained no matter how zoomed in or out you are, and each different creative scene mode offers something artistic and fun without compromising quality. One issue we did notice is that - though the Canon PowerShot SX420 claims to be able to cover well lit and low light environments, it does struggle with anything else than decent lighting. While this model is small, compact, and lightweight - all things beginners and traveling photographers will appreciate - we feel one area that needs improvement is the LCD screen. It is fairly large for a camera in this price bracket, but it is missing the touch aspect. Making it a touchscreen would not only make it easier to navigate, but it would also fill the role of a "step up from a smartphone." Canon has a 1-year warranty for parts and labor that cover errors on their end. For this price, we feel this is an adequate warranty. Close behind the Canon PowerShot SX420 in terms of zoom is the Nikon Coolpix B500. It has a 40x optical zoom - which is just barely behind. It offers 16 megapixels and built-in Wi-fi and Bluetooth as well as Nikon's Snapbridge feature which allows fast uploads and transfers. Like its Canon competitor, this model is made for entry level and beginner photographers looking for a step up from their smartphones. While the average price is similar to the Canon PowerShot SX420, we feel that this model could be bought for less than the Canon if you look for used or refurbished. As an entry level camera, this model is simple and easy to pick up and go with. It does not require digging through the manual to understand features or settings, and the menu navigation is intuitive and easy to follow. Similar to the Canon, this model fulfills its promise of specs almost completely. In regards to the zoom and the ISO though, we feel it needs some more attention. The 40x optical zoom is a great feature to have for a point and shoot camera, but as this model only has 16 megapixels the quality of each image can degrade the further out you zoom. This model also has an 80x digital zoom, which sounds great but performs poorly. Like the Canon, this model also struggles in less-than-ideal lighting due to its ISO range. This can impact the quality of daily pictures as it greatly limits when and where you can take them. Compared to the Canon PowerShot SX420, this model looks more like a professional DSLR camera - even though it is a point and shoot. What this means though is that it is a little bigger, bulkier, and heavier than the Canon. Still, it is not inconveniently bulky or heavy, so it would still be easy to travel with and carry around. One feature we wanted to highlight with this model was the addition of a rotating screen. This feature is incredibly useful for video and photo angles as well as avoiding glare in sunlight as well. The screen does lack a touch aspect, which can inhibit its creative aspect. There is a limited warranty available to cover errors on Nikon's end which we feel is adequate given the price point and specs of this model. This DSLR model features 24 megapixels, a great ISO range (100-25600), and a tilting LCD screen for angled shots. It also has 179 AF points, which is a crazy amount for this size of camera, and it can shoot 11 frames per second - which is the most on this list so far. Unlike the previous models, it is not a point-and-shoot camera. Instead, it is a slim and compact DSLR camera great for traveling and fast shooting, and with the addition of Wi-Fi and NFC, sharing and transferring photos on the go is simple as well. While this is a jump from the previous cameras, for a DSLR model, this is around what you can expect. However, buying used or refurbished models may help lower that price point. For a DSLR camera, this is one of the simplest to pick up and run with. It does not require a lot of manual time, and if you are familiar at all with photography, then picking up this little guy should be easy. Users have nothing but praise for this model. The megapixels and ISO range are great for daily shooting, and the 179 AF point is amazing for landscape photography especially. The one place we will fault this model is the frames per second. Compared to the previous models, 11 is generous. However, in the world of sports or action shots, 11 is almost worthless. Not to say that good shots are not possible, you will just the right balance in every other area as well. So action shots in poor lighting are pretty much out of the question. Not only is this model more compact and lighter weight than its DSLR competitors, but it is also the smallest and lightest model on this list for far as well - which is impressive for a DSLR going up against point and shoot models. The tilting screen this model offers can be a great help to shooting video and photos and different angles, and it can help against glare. However, having a full rotating screen would be more beneficial. We also wish this model had a touchscreen. Sony has a 1-year limited warranty that covers errors on their end that will fix or replace issues with this model. Given the price point though, we find this warranty a little lacking. This point and shoot model is a bridge camera that offers 20 megapixels and 4K video - a hot commodity for point and shoot models. Within that 4K users can pull out 8-megapixel shots as well. It has a 16x optical zoom, a fully rotating screen, and there are attachments for the lens and camera body to bring a little more creative freedom into the mix. It has Wi-Fi abilities, and the lens has macro functioning as well to aid in that creative freedom. Within the camera is an editing option too that allows you to add or edit creative features of images you have already taken. For a point and shoot camera, this is a little high regarding price. However, this model does offer many features others do not, so a higher price is expected. We recommend looking through used or refurbished options for a more affordable option though. As a bridge camera, this model is incorporating creative freedom with point and shoot simplicity - without compromising quality. Overall, this is a great model if you are looking to upgrade from a simple point and shoot. It is simple and easy to understand, even while incorporating some more of the DSLR-type lingo. Our main suggestion here would be to include a touchscreen as that would aid greatly in navigation and would help new or adjusting users. Regarding living up to the specs it promises, the model does well. 20 megapixels goes a long way for day-to-day photographers, though users wanting to do a lot of editing or cropping may find this hard to work with. The ISO range for this model works well and is easy to manage. Having the option of external props and features helps in creative shooting and can boost image quality as well. One thing to consider is that while the 16x optical zoom is not poor, it is also not going to give you the shooting freedom the previous models will. This model is a prime example of where a company took things too far. In their effort to make this model lightweight and easy to handle, they have made it too light. The body is made from cheap-feeling plastic, and after a few months of use, some users reported hearing pieces rattling around inside the camera. So not only would this be a poor choice for users on the go, but it also means that the materials will not last long. Another issue users reported is a ring inside the lens that is easily knocked loose, which could hurt not only your shots but also the lens as a whole. 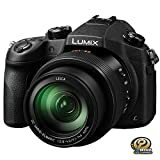 While Panasonic does provide a warranty, many users have expressed frustration in trying to get them to fulfill said warranty - especially regarding the loose ring in the lens we mentioned previously. Overall, the Canon PowerShot SX420 does not do too badly in this comparison. If you are looking for a model that is affordable, easy to work with, and offers basic shooting options, then this model would be worth looking at. Considering its flaws as well as its peaks in performance, we give the Canon PowerShot SX420 3 out of 5 stars. We base this rating off of its poor low light performance, its lack of a touchscreen, and its low frames per second - but also on the portability, this model offers users and the amazing optical zoom built in the camera as well.